Turkey Trot 5K is a fundraiser for Clark County Community Services. The mission of CCCS is to provide a one stop place where Clark County families can receive assistance in time of crises and to promote responsive families toward self-sufficiency. 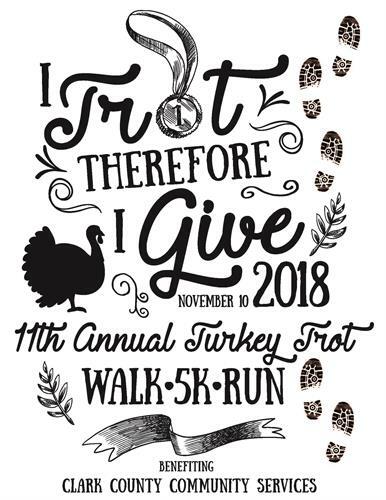 All proceeds from Turkey Trot 5K 2018 will benefit the 1,200 families seeking food, clothing, utility assistance and housing assistance each month. - Register on race day and pay $30 no guarantee for our Official Turkey Trot shirt.